Oh Christmas cookies, let me count the ways I love thee!!! I especially love Spritz Cookies, my mom would always make these every Christmas, by the pounds; I remember coming home from school and I could smell the hint of almond in the house, I knew heaven was waiting within my grimy little hands! Spritz cookies just remind of my mom, and childhood, there is nothing better to stir up a memory then food. So this year I decided to make some myself and share my little piece of heaven with a few of my friends. -whatever food coloring you would like for each batch, and colored sugar. 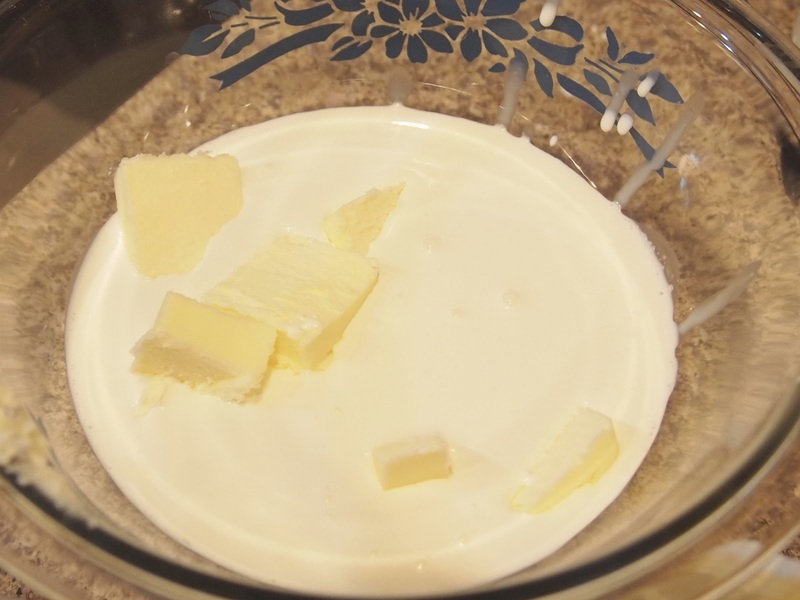 -Mix together the butter and the sugar until fluffy. -Next add salt, almond, egg and mix, scape down the sides. 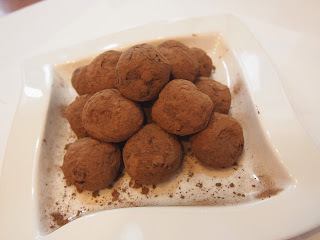 -Now add the flour and food coloring and mix until incorporated well. -Then load up your cookie press and go to town. Bake at 375 degrees for 8 min, if you want them crispy bake for 10. Do not spray the pan or the cookies will not stick on the pan when you press them on, there is plenty of butter in the recipe, it won't stick. Cool for a couple of minutes and eat baby eat! I dare you to try and eat just one, my son and nephew probably had 25 a piece! Then they asked if they were Gluten Free! Yesss! 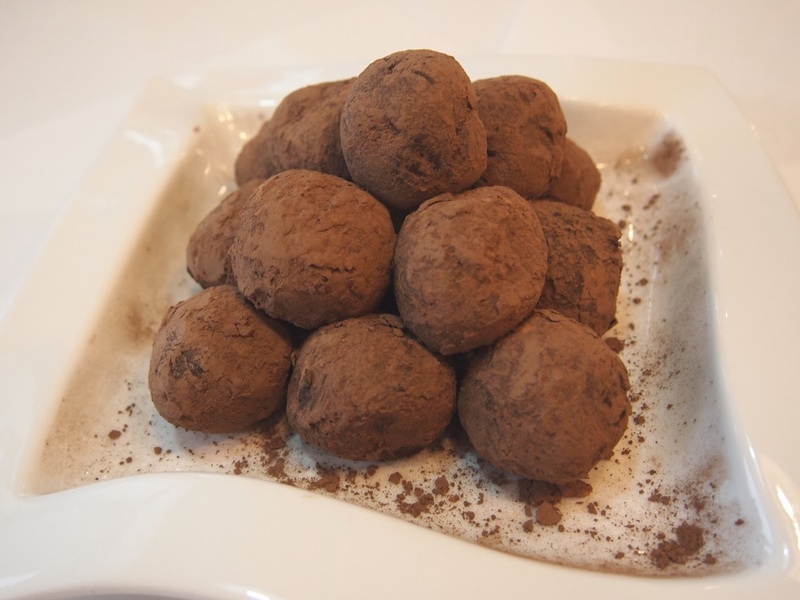 I have been dying to have some truffles, store bought ones honestly. Every time I walk into Costco, I just drool over all of the candy they have in all the fancy boxes and bags; then I pick them up and read the ingredients and start muttering Grinch type curses!!! This happens every time I walk into candy stores, or pretty much anywhere right now.....I love Chocolate and I can't figure out why "they" the makers of all these fun treats insist on putting Gluten in all of them! 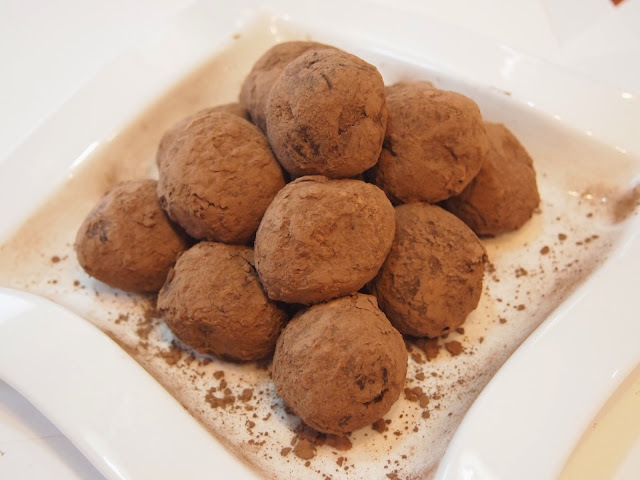 Here are a few other things you can put in or on your truffles- dip them in chocolate, nuts, coconut, powdered sugar, crushed candy canes, liquor flavors,mini chips, pretty much whatever else you can think of. 1-Find a nice glass bowl or a medium sized pan(I used a bowl, I was feeling lazy) add the heavy cream or whipped cream, they work just the same, next add the butter. 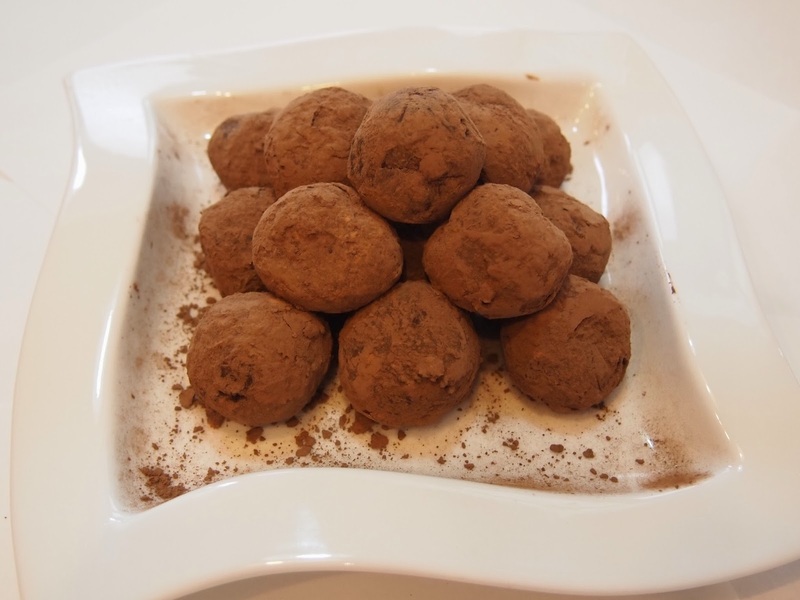 2-Place in the microwave on high for 2 minutes, it will bubble a little. 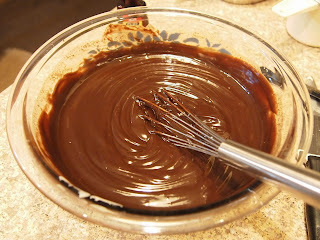 Take it out, add the chocolate chips, but don't stir them, just let them rest for 2-3 minutes and then whisk it together. It will take a minute or two! 3-Place this in your fridge or freezer now until it is thickish and you can roll it into balls. (25-30 minutes) If you have one of those cookie scoops( the little ones) use it. I however do not. 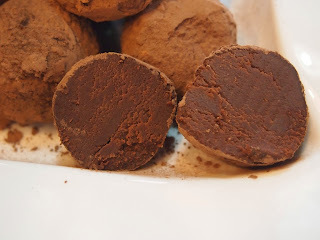 4-I used waxed paper on a cookie sheet and a tea spoon and scooped it out, it made 25 lumps, I let them chill for another 30 minutes in my freezer. 5-Put your gloves on and roll those babies into balls, then roll them in the cocoa, and Viola' you have made melt in your mouth Truffles!!! These are so rich, delicious and they melt in your mouth! They would make a Wonderful Christmas gift! Here are a couple of my favorite things: Heavy Whipping Cream and Heavy Cream, they make any frosting taste creamier and chocolate smoother. They can be use in so many ways,for so many things! 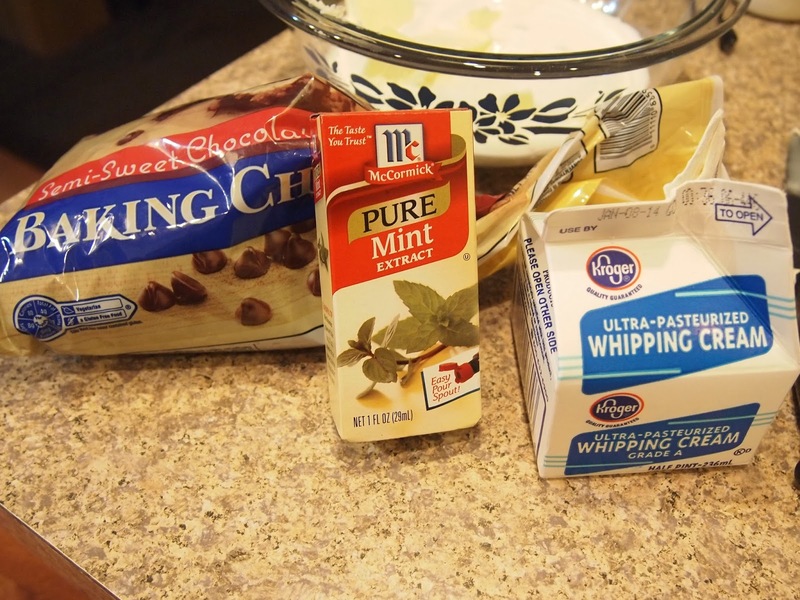 I could only find pictures of Whipping Cream, but there is just Heavy Cream if you prefer.